The mission of Holy Apostles Institute is to prepare future deacons for ministry, according to the Byzantine tradition of Eastern Catholicism. Holy Apostles Institute is affiliated with the Ukrainian Catholic Church, under the auspices of the St. Josaphat Eparchy and Bishop Bohdan Danylo. When the early Christian Church began to increase in number, the Greek-speaking community of disciples complained that the widows among them were being neglected. As we read in Chapter Six of the Acts of the Apostles, the Twelve addressed the matter by summoning the entire body of disciples, Hebrew and Greek, and asking them to, “pick out from among you seven men of good repute, full of the Spirit and of wisdom” to assist them in their work. The community chose seven men, all with Greek names, and presented them to the Apostles. 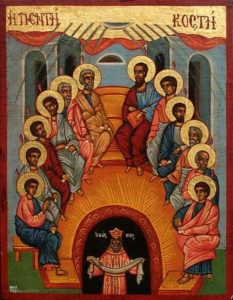 The Apostles then “prayed and laid their hands upon them” and so ordained the first deacons. Like those first seven deacons, men ordained as deacons today are clergy who serve specific needs of the Church. A candidate is admitted to the Deacon Formation Program sponsored by the pastor or administrator of a specific parish with the approval of the eparch or his delegate. It is expected that the candidate will be ordained to serve in that particular parish. All prescriptions listed in the Eparchial Statutes regarding this matter must be observed unless the eparch determines differently. While all Christians are called to charitable service, the deacon is called to be the emissary of Christ among us as the “one who evangelizes and serves.” The deacon must inspire and support others in works of charity, ministry and evangelization. Some deacons also serve in specialized ministries; for example, as a chaplain for a prison, hospital, school, or nursing home, or as a spiritual director for individual directees. It is possible that new ministries may open up for deacons.